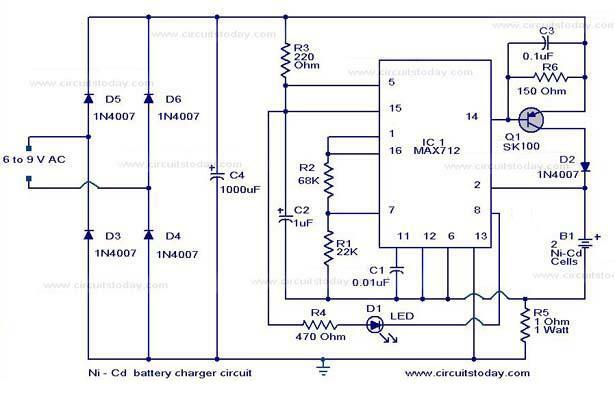 Here isÂ the circuit diagram of an effective and super fast Ni-Cd battery charger circuit.The circuit is based on the IC MAX 712. The circuit is designed to fast charge a Ni-Cd battery at 3oomA. After the fast charging is completed the circuit charges the battery in trickle charging mode at 15 mA. Here the instant to end fast charging and start trickle charging is sensed by dv/dt method as per the data sheet. This method of charging increases the charging speed as well as the battery life. The circuit is designed strictly as per the data sheet from Maxim and found to be working with no flaw. The diode D3 toD6 full wave rectifies the input supply. The capacitor C4 filters the output of the rectifier. The transistor Q1 (SK 100)Â with associated components forms a series pass for driving the charging battery. The LED indicates the fast charging. Transistor 2N6109 can be also used instead of SK 100. Do not connect not more than 2 Ni-Cd cells. If you are using a PCB, it should be well designed and fabricated that there are noÂ unwanted feed back paths existing, which would cause oscillations in the circuit.